A cool and dry weekend has felt more like early April than mid May after a sharp cold front arrived Saturday morning, bringing very gusty wind and some clouds during the morning hours. That front now sits well to our south but will start to lift north during the day tomorrow. The front, and upper level systems that traverse the area, will set the stage for an unsettled work week ahead in the weather department. Those looking for summer weather will be disappointed this week, though it's a bit early to be expecting mid 80s or warm temps every day. 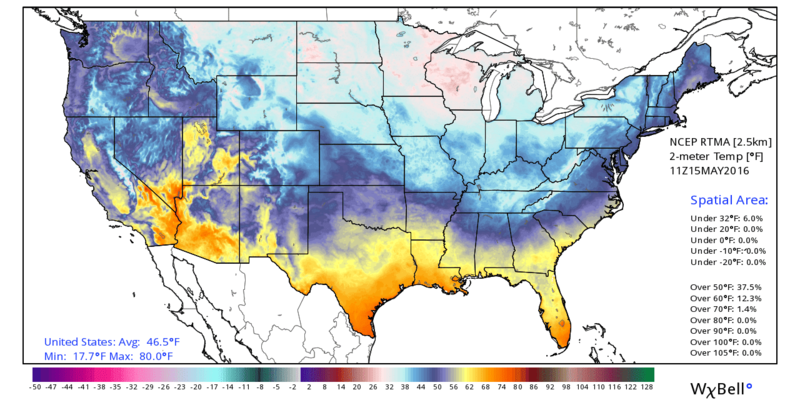 Cool surface high pressure and an upper level trough centered over the Great Lakes and eastern Canada brought well below normal temperatures to a large portion of the northern and central U.S. this morning. Cool weather was found throughout the northern half of the U.S. early this morning (5am CDT) with over 60% of the U.S. below 50°. An upper level trough over the Great Lakes is responsible for the near freezing temperatures in the Upper Midwest. Graphic courtesy WxBell. As the northeastern trough shifts east, a developing trough over the western U.S. moves over the Rockies, replacing upper level ridging (high pressure) over that region. In our section of the U.S., our cool flow from the northwest becomes more westerly, allowing upper level energy over Texas to move across the Mid-South. With dry and relatively cool air in place, that upper level system will bring increased cloud cover but initially only light rain that begins during the day Monday. Eventually, low level dry air will saturate and showers will become likely in the afternoon. Mid-day Monday's surface map shows a stationary front along the Gulf Coast, but rain chances increasing (greens) in the Mid-South as upper level energy approaches from the west. 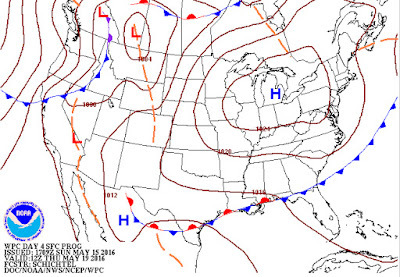 Overnight Monday night, as low pressure at the surface moves into the southern Plains, Saturday morning's cold front returns north as a warm front, putting the Mid-South in the warm sector of the approaching low from the Plains on Tuesday. The atmosphere will respond with warmer temperatures but increased chances of thunderstorms on Tuesday after a mainly dry period Monday night. Widespread severe weather is not anticipated as the upper level dynamics and wind energy are fairly weak, but a few storms could contain a strong wind gust or small hail as temperatures aloft become colder. The Storm Predication Center currently has the area under a Marginal Risk (category 1 of 5) severe weather outlook area for Tuesday with a higher risk well to our west. 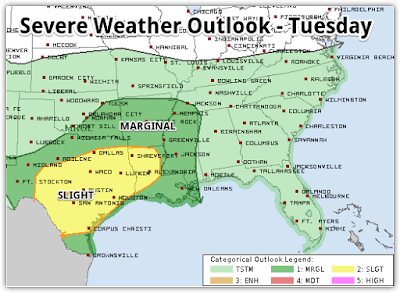 A Marginal Risk (category 1 of 5) severe weather exists Tuesday with higher chances of strong storms to our southwest, according to the Storm Prediction Center. A few storms could have strong wind gusts or small hail. The Monday night warm front begins sinking south again Tuesday, prompting some of those thunderstorms, then moves through Tuesday night, once again placing us in the cooler airmass heading into the mid-week period. Scattered showers are possible again Wednesday, though the best chances will be across areas south of I-40 in MS. With the front to our south, high temperatures will be back into to lower end of the 70s. 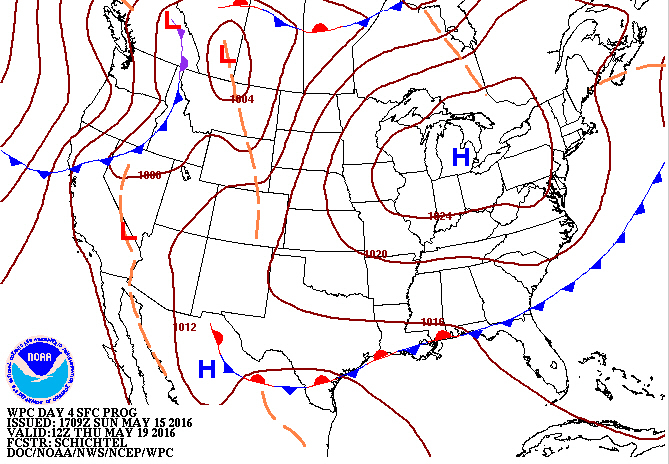 High pressure to the north will push the front a little further south on Thursday, which should mean drier weather. High pressure aloft and more sun also should allow temperatures to warm back up to near 80 on Thursday. By Thursday morning, the front returns to the Gulf Coast as high pressure builds in to our north once again, leading to what will most likely be the driest day of the week. 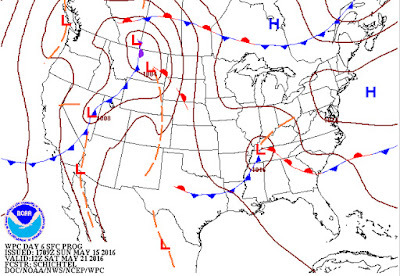 Finally, to end the week, low pressure at the surface develops to our west and moves into the region. The track of the low is still uncertain but rain and thunderstorm chances look to increase significantly. The possibility of severe weather is still too uncertain to make a call on, but will need to be monitored, especially if the low tracks by to our west and we can get sufficient wind shear and warm unstable air. Stay tuned. 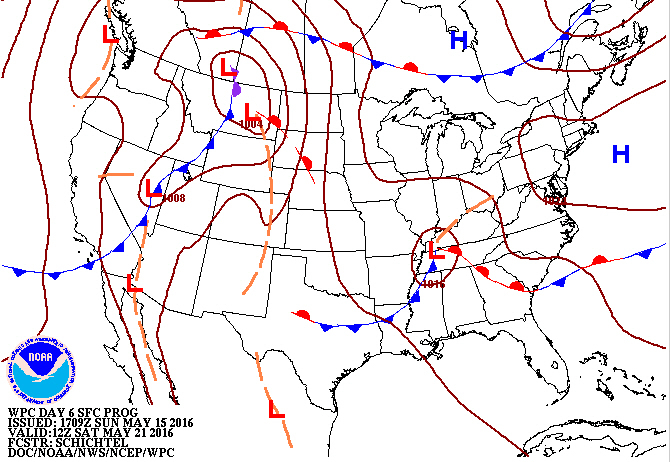 While still 6 days out, the NWS places a surface low just to our east Saturday morning. 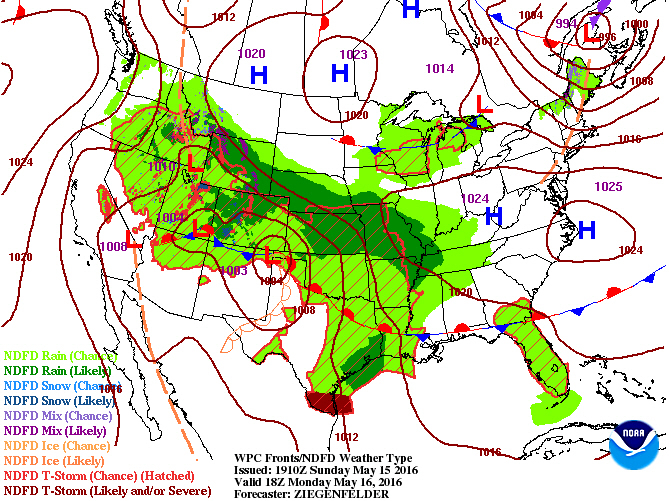 As it approaches Friday, rain and thunderstorm chances increase significantly. A few lingering showers or thunderstorms could remain Saturday before a warming period begins heading into the last full week of May. With an upper level trough remaining to our northwest on Saturday, we could still see some lingering rain chances. It looks like high pressure aloft and at the surface begins building in to end next weekend and start the last full week of May so that those who want to get early use of their pools may get some warmer days in the 80s as we head towards the end of May! Click here for the complete week-ahead look at the MWN Forecast or check it via our mobile apps linked below.